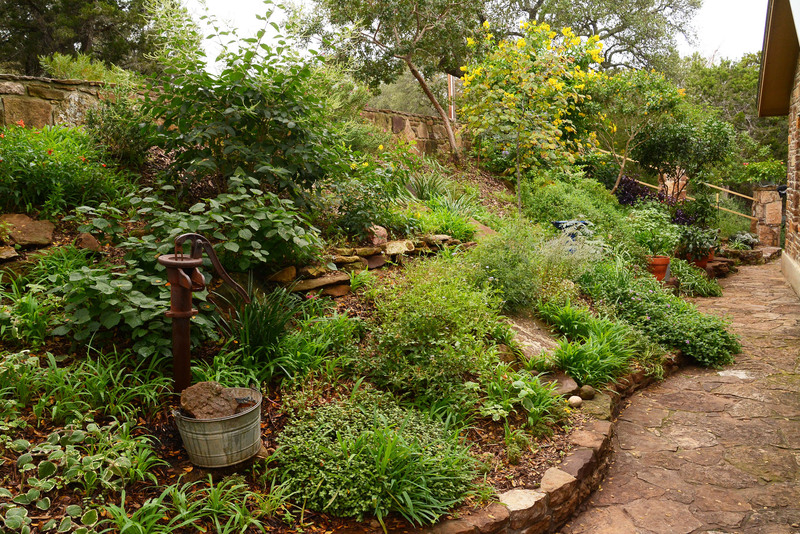 California horticulturist and designer Nan Sterman knows that water thrifty gardens don’t have to be blah. Author of Hot Color, Dry Garden, and host of A Growing Passion on PBS, Nan pulls together eye-popping designs with plants, architecture, furniture and accents. 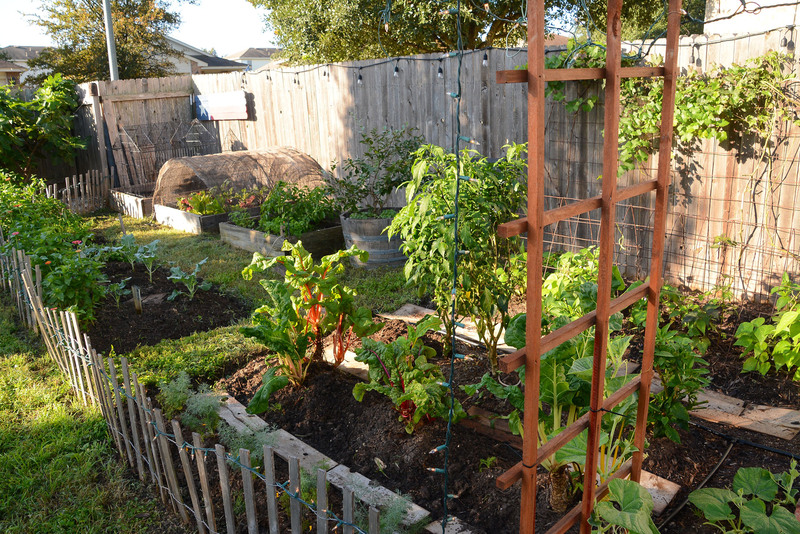 On tour, Julie Patton and Eric Pedley of East Austin Succulents packed bold into their small garden with colorful recycles and striking succulents. Is flaking bark on a Monterrey oak a sign of trouble? Daphne has the answer. For tasty summer color, just add purple basil! John tips over nursery pots to inspect plant roots to see if they’re ready to come home with you. 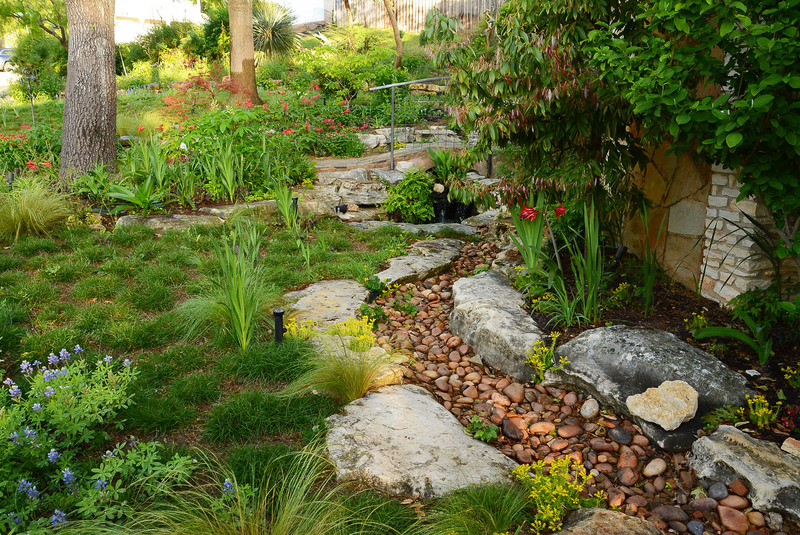 California horticulturist and designer Nan Sterman knows that water thrifty gardens don’t have to be blah. Author of Hot Color, Dry Garden, and host of A Growing Passion on PBS, Nan pulls together eye-popping designs with plants, architecture, furniture and accents. Thanks to Scott Jones for pictures of his four-year-old Monterrey oak. It seems healthy, but recently he’s noticed that the bark is peeling off. Scott points out that there are several black holes on the trunk, though some of the black is pruning paint. The new buds are hard with black tips. Plus, in late April, the tree hasn’t produced as much new growth, just leafed out on existing growth. We checked with certified arborist April Rose who said that the peeling bark is typical for that species at that age. Monterrey oaks, like live oaks, start with fairly smooth bark and develop texture as they age. Monterrey oaks, also known as Mexican white oaks, are semi-evergreen to evergreen, meaning that if they drop their leaves, they do so in the early spring, just before they put on their first flush of new growth. In cold winters, as in 2017 and 2018, most Monterrey oaks in Central Texas leafed out late. April Rose circled back to say that hers leafed in mid-May. So, before new leaves emerge, last year’s leaves and twigs may look a bit unkempt and unhealthy. As with all trees, April recommends applying compost annually, maintaining 3 inches of mulch to the drip line or further, and watering deeply. 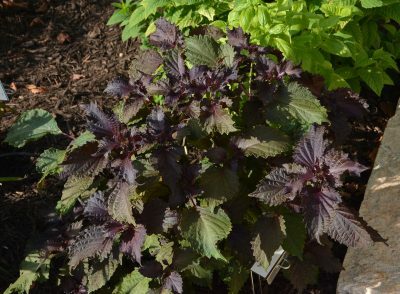 Ocimum basilicum 'Purpurascens' Purple basil’s spicy, anise flavor and frilly, deep purple leaves bring good taste and color to the summer garden. Plant in well-drained soil in full sun to part sun. When harvesting, pinch at a leaf union and leave at least six inches of the plant for recovery and new growth. Getting as tall as 18”, consider it a summer annual. Although it needs extra water in dry summers, avoid watering the leaves or giving the soil soggy conditions. John tips over nursery pots to inspect plant roots to see if they’re ready to come home with you.